Focus and speed are essential for managing parallel projects successfully. They smooth the path from an idea to its realization. דוא"ל, phone calls and bright ideas occurring in the middle of a work session make a project's realization harder. Distractions can be minimized and focus and speed can be intensified through the design of a special-purpose computer workstation. I built my computer workstation specifically to support the design, development and operating activities for my startup, SOFIns. This workstation has unique features to handle distractions efficiently and support the project-juggling demands of entrepreneurship. 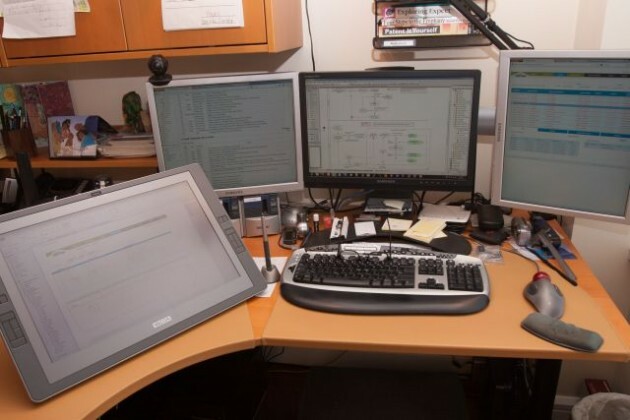 This set of articles discuss how I built this workstation and how I use it to manage parallel projects productively. © ג'ון Jaroker כל הזכויות שמורות. אין תמונות להעתיק או להשתמש בם ללא הסכמה מראש ובכתב של בעל זכויות היוצרים. לפרוס ומתוחזק על ידי SOFIns.